This midcentury Italian pottery bowl was designed by Aldo Londi for Bitossi in Italy and sold by Raymor in America sometime around the 1960s. The Raymor sticker is on bottom. 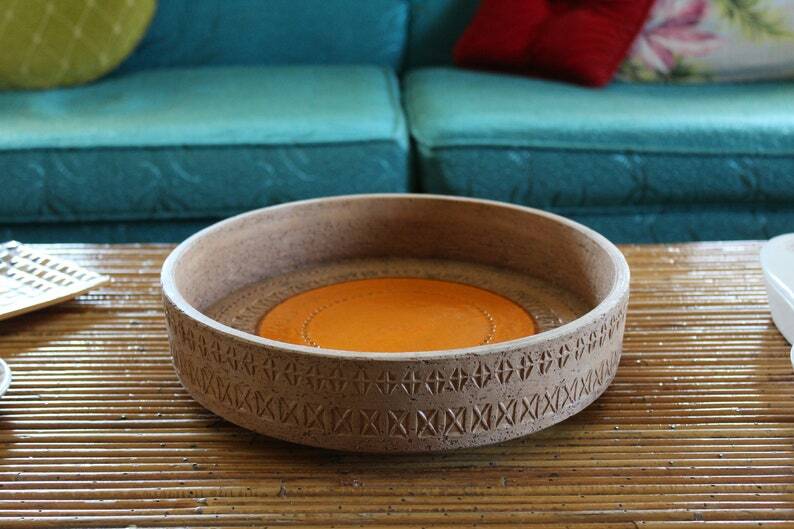 It is a large fruit bowl made out of Bitossi's signature sand-colored textured pottery with incised designs and a high gloss, bright orange glaze in the center. It is very heavy. This Bitossi console or centerpiece bowl is in excellent vintage condition. There is some darkening in the designs on the interior and the felt protectors on the foot are loose. No chips, no nicks, no scratches. Please use your zoom for a good look.